It was with some apprehension that Capt Steven DeFord arrived at Concord to take his Form 5 ride with Capt Jeff Ironfield. His last Form 5 was 3 years ago, in a different state (PA), and a different airplane (round dial C172). 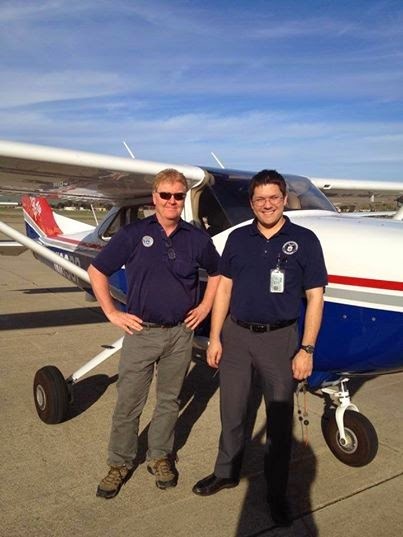 Thanks to the time volunteered by Lt Col Brett Dolnick and Capt George Michelogiannakis cross-training to the G1000, Capt DeFord was deemed ready for his checkride, and after one missed opportunity due to weather, it was finally time. The ride started by playing to Capt DeFord’s strengths -- flight by reference to instruments (Capt DeFord is an instrument rated pilot), maneuvers, and ground reference. The lack of wind certainly helped with the ground reference maneuvers! This was helpful in alleviating Capt DeFord's worries before coming back for the more challenging parts of his ride -- use of the G1000 bells and whistles and performance landings. Capt DeFord claims some of his landings were less than glass-smooth. Nonetheless, Capt Ironfield was able to confirm his safe piloting skills, and granted him a pass on his Form 5, making Capt DeFord Squadron 188's newest VFR/TMP pilot. Besides being a capable pilot, Capt DeFord is an Emergency Room physician. He has been a member of CAP since 2010 and of Squadron 188 since 2013. He serves as the squadron’s Operations Officer.